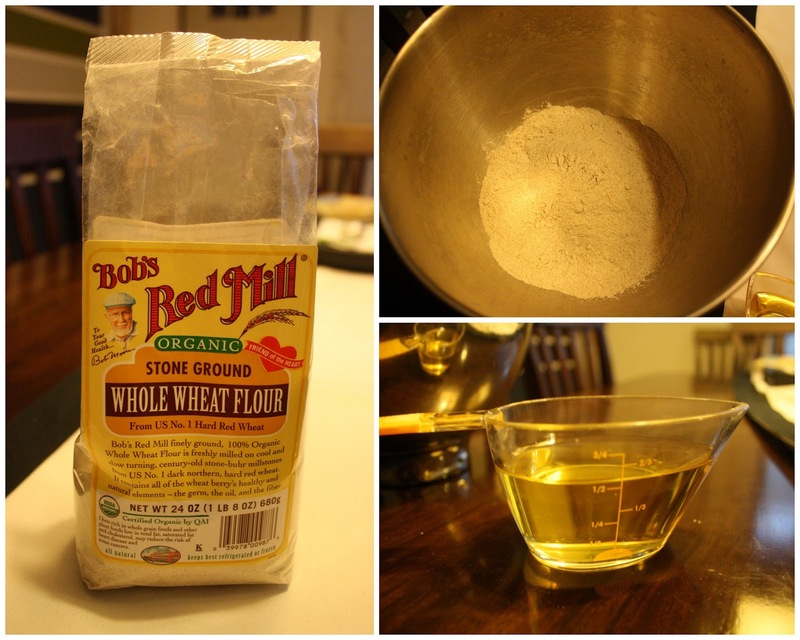 Recently, after deciding to start eating healthy, I made an effort to prepare some home made whole wheat tortillas. Since I had my own stand mixer (and needed a good excuse to use it again! ), I then waited for the right time. Right time translates as - kids are asleep or busy, husband is home to keep an eye on them, I have no current work deadline and housekeeper is available to clean up any mess that will result in this attempt. So when the right time came one early evening, I immediately went to work. I wanted to serve some of these tortillas for dinner, and then freeze the rest so we can just reheat them anytime. It didn't take long for me to make them as the recipe was quite simple and required only a few ingredients. 1. In the bowl of a heavy-duty mixer set with a dough hook, pour in the flour, oil and salt. Beat with the paddle until crumbly, about 3 to 5 minutes. Scrape the sides as needed. If your hand-held mixer comes with dough hooks those can be used as well. 2. With the mixer running, gradually add the warm water and continue mixing until the dough is smooth, about 3 minutes. 3. Take out the dough and divide it into 12 equal sized pieces. I do this by making the dough into a big log shape that is about 8 – 10 inches long. Then I cut it in the middle. Then I cut each of those pieces in the middle and so on until you have 12 pieces. 4. Using the palms of your hand roll each piece into a round ball and flatten it out on a baking tray or board. Cover with plastic wrap and let rest at room temperature for at least 15 minutes or up to one hour. 5. Heat a cast iron skillet, griddle or 12-inch skillet over med-high heat. The pan should be fairly hot before you begin cooking the tortillas. 6. On a lightly floured board or counter top, use a rolling pin to turn each ball into a 8 to 10 inch flat circle (measure against your recipe if printed on a 8.5X11 sheet of paper). Be careful not to use more than a teaspoon or two of flour when rolling out each ball into a tortilla because too much excess flour will burn in the pan. 7. Grease the pan with a touch of oil (or ghee) and then carefully transfer each tortilla, one at a time, to the pan and cook until puffy and slightly brown, about 30 to 45 seconds per side. Set aside on a plate to cool slightly. Eat within an hour, refrigerate or freeze. grated mozarella cheese and sour cream with these tortillas! And fresh iceberg lettuce of course!